Measles Outbreak And Vaccination Gaps In Washington State : Shots - Health News So far this year, 55 measles cases have been confirmed in Washington state, most of them in unvaccinated children. 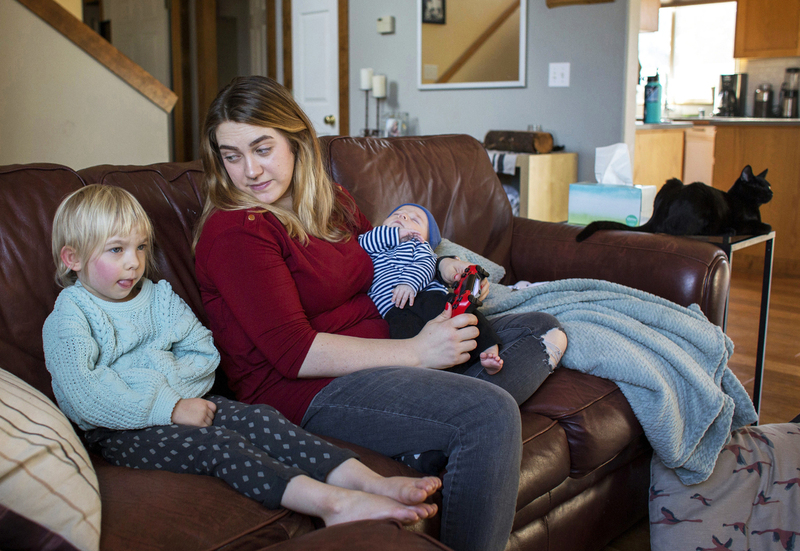 The outbreak's epicenter is Clark County, Wash., just north of Portland, Ore.
Amber Gorrow and her daughter, Eleanor, 3, pick out a show to watch after Eleanor's nap at their home in Vancouver, Wash., on Wednesday. Eleanor has gotten her first measles vaccine, but Gorrow's son, Leon, 8 weeks, is still too young to be immunized. A measles outbreak in Washington state prompted Gov. Jay Inslee to declare a state of emergency on Jan. 25. As of Thursday, 55 cases have been confirmed this year, most of them in unvaccinated children under age 10. The outbreak's epicenter is Clark County, Wash., just north of Portland, Ore. Measles is a highly contagious disease that can result in brain damage, deafness and, in rare cases, death. In 2000, measles was declared eliminated from the United States, thanks to widespread vaccination campaigns. Yet cases have popped up in 11 states so far this winter, and the Centers for Disease Control and Prevention is tracking three outbreaks (defined as three or more confirmed cases) in New York City, New York state and Washington state. Vaccination rates around 90 to 95 percent are generally enough to prevent an outbreak, according to health officials, but rates have fallen across the United States. One factor is the spread of misinformation about the measles vaccine, which is considered safe and effective by health authorities. Vaccination rates in the Pacific Northwest are among the lowest in the nation. While all school-age children are required to receive the MMR vaccine, which protects against measles, mumps and rubella, Washington is among the 17 states that allow "philosophical exemptions," meaning a parent can excuse a child from being vaccinated for virtually any reason. Currently the vaccination rate across Clark County is 78 percent, but some schools in the area have rates under 40 percent, according to the Clark County Public Health website. Such low rates have public health officials working around the clock to contain the outbreak. NPR's Ari Shapiro spoke with Dr. Alan Melnick, director of public health for Clark County, about the situation. Here are highlights from the interview, which has been edited for length and clarity. Are parents to blame for this outbreak? I don't want to point the finger at anybody. I think there's a lot of misinformation on social media and elsewhere that looks pretty sophisticated. And I think some parents who are otherwise well meaning are scared and they don't know what to do, and some of them choose not to vaccinate their kids. But bottom line, this was preventable? This problem was 100 percent preventable. What we're seeing here does not need to be happening. We should have eradicated measles not only from the United States but from the world by now. Tell us about how dangerous it is. I know it's highly contagious. First of all, there is a lot of misinformation out there on social media, from people who are opposed to vaccination, about how serious this is. Measles is not a benign disease. It is a potentially deadly disease. Before we had routine vaccination in the United States in the early 1960s, we had 400 to 500 deaths from measles every year. There were close to 50,000 hospitalizations every year for measles, and we had about 4,000 people who had measles encephalitis, which is a swelling of the brain that can lead to permanent damage, including deafness. It's an incredibly serious disease that can have a lot of complications, and we've already had one child hospitalized out of the cases here. It is also highly contagious. If you're susceptible and you haven't been vaccinated, you can be in a room two hours after somebody with measles left and still catch it. If somebody with measles is around a bunch of people who are unvaccinated, 90 percent of them will become ill. The early symptoms of measles are runny nose, cough, fever and red or pink eyes, which are very common symptoms this time of year. And those symptoms occur several days before the rash appears. You're exquisitely contagious at that time, and you may not even know that you have measles. You're also contagious after the rash starts. But for a few days before the rash starts, if you go out in public with those symptoms, you can spread the disease without knowing it. The only way to know that you're not going out and spreading that disease is to be vaccinated ahead of time. What's happening to the children who come back with a positive diagnosis for measles? Because you're contagious for four days after the rash onset, children would be kept home until then. Four days after the rash begins, you're generally not contagious. When we are able to identify a child who's got measles, [from a public health perspective] we are concerned with identifying where they've been during the period they were contagious, because we want to prevent it from spreading. We've got to be concerned about the people who were exposed who aren't immunized. Your department has put out a list of public exposure locations in Clark County that includes doctors' offices, schools, day cares, churches, a Trader Joe's and a Walmart. Are you saying any unvaccinated people who are at those places during a particular window of time could become infected? Yes. This is one of the most contagious viruses known to mankind. It's airborne spread and can linger in an area up to two hours [after] somebody leaves. If the exposure site is in a school, we have to work with the school to identify any children and staff at that school who are unvaccinated. And we have to exclude them from school for 21 days, which is the amount of time it could take to develop measles. No, Seriously, How Contagious Is Ebola? We are particularly concerned if the exposure is in a doctor's office or an emergency department, because the people most at risk of getting measles are infants who are too young to be vaccinated, people with immune suppression who you might run into in an emergency room or doctor's office and pregnant women who haven't been vaccinated. Washington is one of 17 states that allow a philosophical exemption for vaccinations. Do you think that's a mistake? I'm supportive of changing that exemption. In Washington state, there are three ways to exempt your child from the immunization requirements in school. One is a medical exemption, which is really rare. There are very few medical contraindications to immunization. There is a religious exemption that's also rarely used, because there aren't many religions I can think of that say, "Thou shalt not vaccinate your child." So the vast majority of exemptions are personal or philosophical. California got rid of their personal exemption a few years ago after the Disneyland outbreak, and I'm hoping that the Washington State Legislature does the same. You can actually go on the Washington State Department of Health website and look at our interactive map to see immunization rates at any school in the state. The average overall immunization rate in K through 12 in Clark County is about 78 percent, and for measles, for herd immunity to stop transmission, you need something like around 90 to 95 percent. The 78 percent average is bad enough, but there are schools within Clark County with immunization rates far below that. That really keeps me up at night, because if you introduce measles to a population like that, it can spread very rapidly. You trained as a family physician at a time when measles was not considered a threat because people were getting vaccinated. What is it like to see this disease threaten American lives once again? There is no reason we should be experiencing an outbreak like this anywhere anymore. Having a child hospitalized is horrible enough, but to think that we could have a death from this, or a severe complication like measles encephalitis, is unconscionable. Could I ask you to just speak for a moment to parents in the United States who have not vaccinated their children? What is your message to them? One message is that this disease is horrible. We need to protect our children. And ... regardless of what you hear on some of the social media sites, the vaccine is safe, effective, and it's inexpensive. 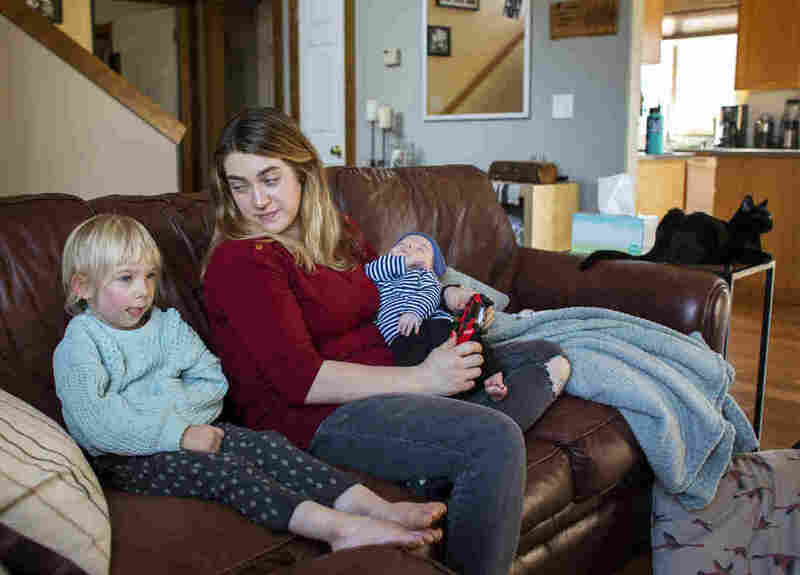 Besides [thinking of the safety of] yourself and your children, we need to think about protecting those around ... us who might not be able to get the vaccine, like infants who are too young or people with severe immunosuppression. Immunize your children not just to protect them, but to protect anyone they might come in contact with. Already in Clark County, we've had to give immunoglobulin to a number of infants too young to get vaccinated who were exposed. We're hoping the immunoglobulin works. It's not the first choice, but it's the only thing we have for those infants. Why do you think the campaign to get people to vaccinate their children hasn't worked? I think we've been complacent, and there's a lot of misinformation out there. ... Measles is still out there, and it's only a plane ride or bus ride or a car ride away.